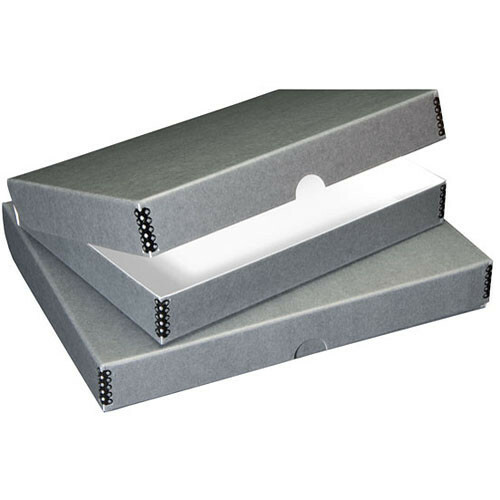 The gray 18 x 24" Folio Storage Box from Lineco is used by photographers, artists, and archivists for storing and protecting photographs, flat art, documents, and other paper materials. The exterior of the storage box is made from an archival boxboard, and the interior is buffered and acid-free, which preserves and prevents acid deterioration of paper materials. The clamshell designed box has a thumb-cut in front of the top half of the box for easier access to the interior. Each corner has a metal edge for added strength and durability, making it ideal for stacking multiple boxes. Box Dimensions (LxWxH) 24.7 x 18.5 x 2.3"
Folio Storage Box (18 x 24", Gray) is rated 4.9 out of 5 by 10. Rated 5 out of 5 by Diane from Just what I needed - would buy again Perfect for storing my watercolor paper and paintings. I also have a larger similar box for my larger papers. Rated 4 out of 5 by Anonymous from Great box for photo storage I use this box to storage my photo prints. It's light which makes it easy to carry around. The corners of the box are metallic preventing it to break easily. Good price /quality option. Rated 5 out of 5 by KH from Excellent value for money A very good, sturdy archival print box for the cost. The color is handsome, enhancing the presention of fine art to the buyer. Rated 5 out of 5 by Susan C from Quality storage boxes These boxes are very well made and sturdy. They arrived quickly. I'm pleased with them. Rated 5 out of 5 by AnnieK from !! Great price, great size, durable, good for keeping photos safe. Rated 5 out of 5 by Anonymous from As ordered Just what I wanted to store my photographs. Rated 5 out of 5 by Laura from Lineco folio storage box Just what I was looking for! Is this produce buffered, acid free, lignin free, PAT? I don't know it holds up well and looks good.